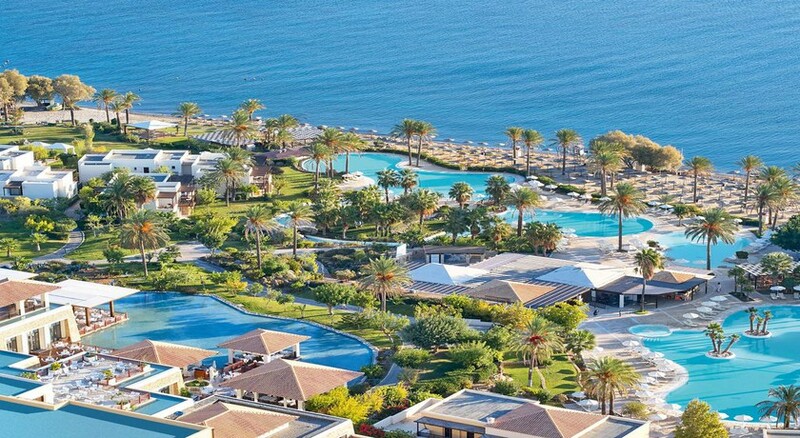 Fondly called the Water Palace, Grecotel Kos Imperial Thalasso in the Kos resort of Greece offers luxury stay in the lap of nature. Admire stunning views of the Aegean Sea as you reside in village-style bungalows and villas, set amid lagoon pools, waterfalls and rivers meandering through verdant gardens. Perfect for families, the hotel features spacious and elegantly decorated guest rooms and suites that come with comfortable furnishings, while the luxury villas overlook an idyllic beach, where you can enjoy breezy cocktails from the beach bar or fresh seafood from the beachfront pavilion. If you want some sporty action and fun, the hotel offers a range of indoor and outdoor pools, a private pebble beach with umbrellas and sun beds, water sports centre offering everything from wind surfing to aqua diving, tennis courts, beach games and a thalassotherapy centre. While adults are unwinding at the spa, kids can have fun at the Grecoland Children’s club, or enjoy an array of attractions, including kids’ pools, child-friendly beach, lazy river, playground and fun activities. The hotel is located in Psalidi area of Kos and it is close to all popular attractions such as Ancient Agora (5.5 km) and Kos Castle (5.6 km). The bus stop is right in front of the hotel, while necessary amenities like bank, hospital and chemists are around 4 km away. 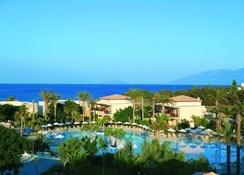 The hotel is 35 km away from the Kos Airport and the Kos harbour is at a 3 km distance. 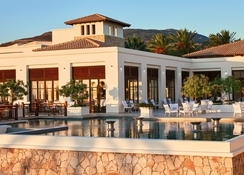 Grecotel Kos Imperial Thalasso offers a clutch of fine restuarnts and bars, all of which have outdoor terraces to let you enjoy your food or drink while soaking in the amazing views and Aegean breeze. 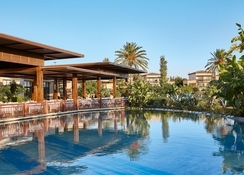 The Lagoon serves Mediterranean delights during breakfast and dinner, while The Pavilions a la carte restaurant offers modern food with a Greek twist. Resembling a Greek tavern, Corals Restautant is the right place for a quick lunch by the pool. The beachfront Pirates of the Aegean serves fresh seafood alfresco. The bars include Colonial lounge bar and Tritons beach bar. The hotel also offers in-room dining and Tasty Corner for kids to enjoy fresh food and drinks any time of the day. There are ample opportunities for recreation and relaxation for the guests. The hotel has six pools, including seafront lagoon pool with lazy river and waterfalls, landscape pool, garden pool, children’s pool, indoor heated pool and Thalasso pool. Activities like tennis, water sports (surfing, wind surfing, sailing, water skiing, catamaran sailing, canoeing, pedal boats) and bike rental can be availed at charge. Morning gymnastics, water polo, aerobics, beach games, table tennis and billiards are free activities. The Thalasso spa offers a range of treatments and massages. The hotel also organises entertainment shows, music and dance for guests. Kids can have fun at the Grecoland Club that arranges fun activities and games for children between 4 and 12 years. There’s also a kid-friendly Blue Flag beach, playground, water sports and pools. Once in a week the hotel organises Parents-day-off, where parents can have a romantic evening while kids are entertained at Grecoland. The Grecohotel offered superb facilities at a reasonable price. dining area ,pools and entertainment area were all high quality and I would highly recommend it.